Welcome to part 9 and the last of a series of articles on my N scale model train layout.As the train layout is now completed, this article has a double shot ofphotos of all parts of the layout and various locomotives.For those who have been reading all along, thank you, and I hope you findthe views as enjoyable as I do.For those who just arrived at this last article, there are links at thebottom of this page that will take you to the construction detailsand the making of the layout.Can you spot the four locomotives in the picture? (Hint: green, blue, yellow, silver).Click on the photos to see a larger view. 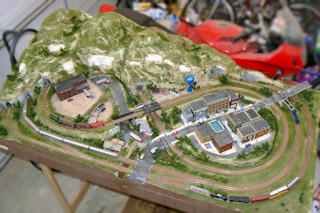 To the right is the completed overview of the layout. It is basically the twistedloop of the Woodland ScenicsScenic Ridge layout, but there have been a few changes.An extra loop has been added around the outside. To accommodate the loop, twotunnels have been added through the mountains.Also, the track has been changed from Code 80 to Code 55 track which is smaller andcloser to scale of real rails. An extra bridge and tunnel has been added to smoothout the ramp to the factory.And a few extra buildings have been added, including a low rent district "on the other side of the tracks." A Union Pacific GP-40 rounds the bend. 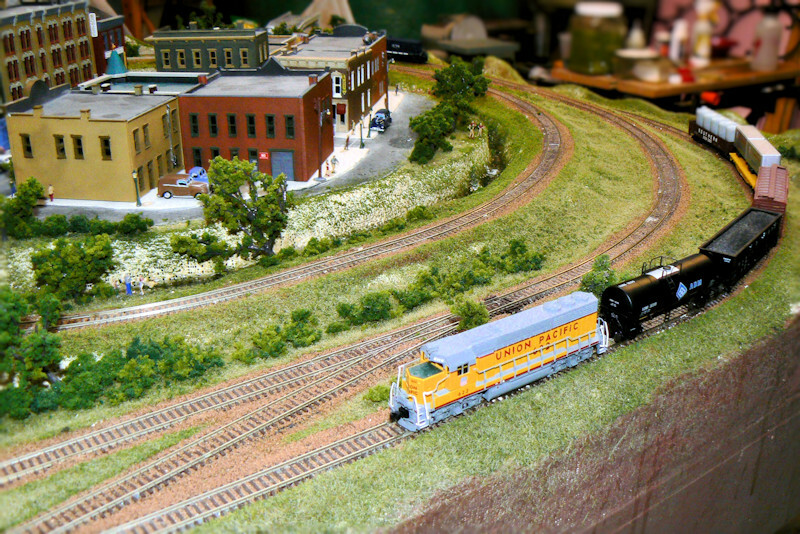 Here a Union Pacific GP-40 rounds the bend. This type of train is verycommon in Austin and the western states.Note the various cars.Most times a train consists of one predominant type of cargo: stone, oil,automobiles, container cargo.I thought that a hodge podge like this would never exist, but thenone day I was running in downtown Austin, and I saw a verysimilar train run by overhead: an older loco, and just about one of each carbehind it. This part of the track transitions to grasslands.Not many rocks on this side of town. The GP 40 overtakes an RS-1. Here the GP-40 (workhorse of the 1980s) overtakes an older RS-1 (workhorse of the 1940s).The RS-1 is in green and yellow livery of the Jersey Central Lines which werecommon in the town I grew up in, a way back when I was growing up.The RS-1 tows some vintage box cars from JCL and Florida East Coast, yetanother area I grew up in. Like a few other photos in this series, I digitally blurred out thebackground.Nothing to see back there except your typical cluttered suburban garage. 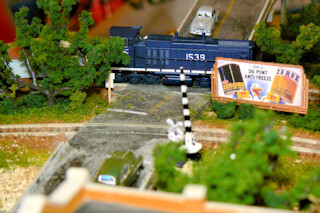 An MP-15 makes a crossing. 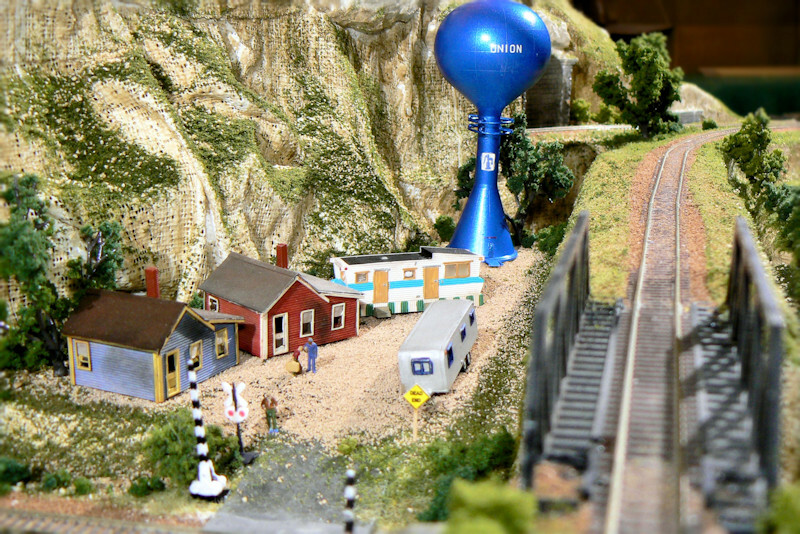 Here is a modern MP-15 crossing one of the street grades.The blue color scheme is common here in Austin and is the colorof the Missouri Pacific. 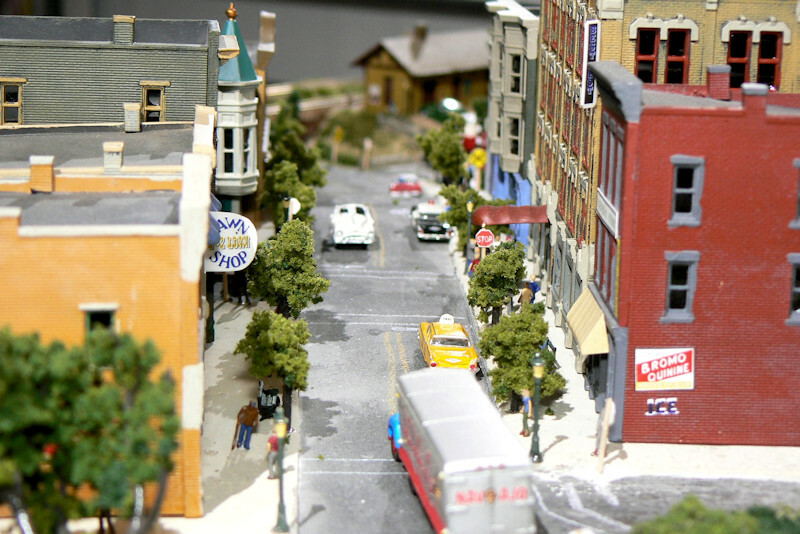 As we say Mopac.I've added a bunch of doodads to the layout like thisbillboard, some crossing guards, and a few signs. 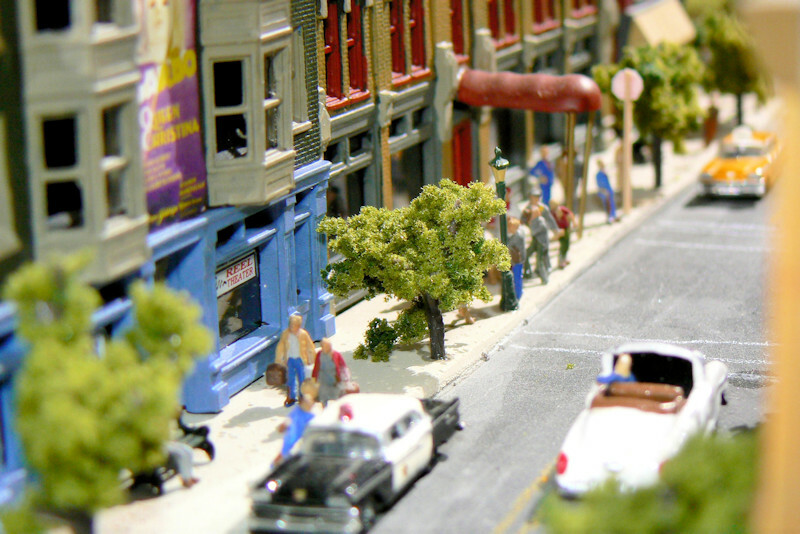 The town bustles on a typical Saturday. Here is what the town looks like on a Saturday afternoon.The folks are out shopping and strolling about.The big old hotel on the right forms the center point of the town.Notice the trees and the lamp lights along the road. 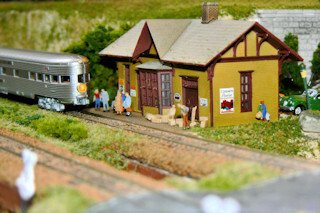 There are also a bunch of N scale people (about 10 mm tall) walking about.You can buy them prepainted, but they are quite expensive that way.About $10 for about 8 people.I bought the jumbo pack of 100 from Preiser and painted them myself.It is easy if you have ever painted historical miniatures.Unfortunately with the Preiser pack you get lots of European peoplethat look kind of odd in this town.So I tucked the family with lederhosen up in the mountains.And the black woman wearing the dirndl dress is alsoquite unusual in this town and tucked away out of sight. Here is the downtown part of town.Lots of shoppers.A few people were clipped and put into the convertible automobiles. Another strange observation about the Preiser people pack.They give you two wedding parties where I am sure one would have sufficed.I think most smaller towns only have one wedding going on at a time.They also give you tons of swimmers.That might be fine for a beach town, but for most small towns in America,there are not a lot of swimming holes down by the railroad tracks.So my town has a lot of people swimming in dirty old drainage ditchesbecause I don't have a beach here.Similarly the Preiser kit has lots of people on the move, carryingbags, and ready for travel.I guess most city scenes would have a busy rail station or bus depot.Here in this town there is only one station, and the traindoesn't come by that often or else the town would be empty. Already some are visiting the bar. 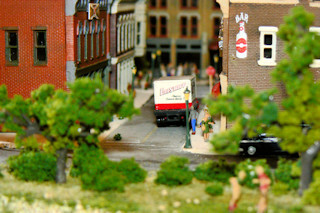 Here is the one side street in my town.Of course the bar is at the end of the side street.For a small town the bar is very busy for this early ona Saturday.Oh well, maybe the game is over, and it is too late todo anything with the crops.At least the Falstaff beer truck(a die-cast model from Classic Metal Works)is keeping the place stocked for the night. Get some gas before Sunday. Here is Ernie's Service Station.The model is a laser cut basswood kit from Blair LineStructures.Ernie's is closed on Sundays so you better get your gas tonight. Some are catching an overnight home. 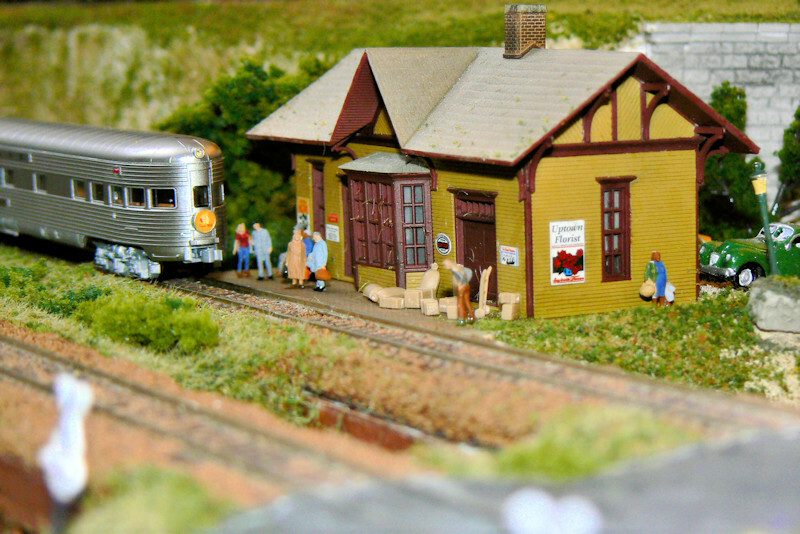 Here some people are catching the overnight out of town.This building is the Golden Valley Depot, a prebuiltkit from Bachmann.It is more expensive than a DIY model, but it lookspretty good for a prebuilt.The paint job us nice, and there are plenty of posterdecals on the model.Just weather it a bit, add a few people, and you areready to deliver people and packages. 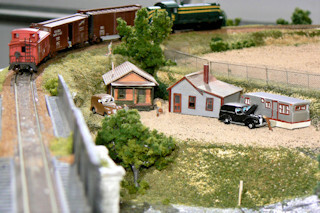 A view from the other side of the tracks. Here is a view on the other side of the tracks.This is the low rent district in town.The view is not so nice. The yards are somewhat small.But hey, the price is right.The water tower is from Walther's Cornerstone seriesIt is built and painted to represent a famous water tower in New Jersey.The dirty company houses are also from Blair Line Structures.The trailer homes are from NuComp Miniatures. We just missed the old train go by. Here is phase II of the low rent district.The old RS-1 just rumbled by. The old RS-1 is an Atlas model from many years ago.It is not DCC ready, but I have attempted to make it so.I replaced the Atlas frame with a DCC ready frame, andthen I carefully wired in a Digitrax Z scale decoder.With the decoderand the LED lights in place, the body never fullyclosed on the frameI had it running for a while, but I think I created a shortor a disconnect when I attempted to crush the body on more tightly. It is a pretty rare JCL color scheme, so I don't want to trash this loco.At the same time, I am tired of debugging it.I think perhaps I will get a newer DCC-ready RS-2 and see if thisbody fits there. If not I will retire this modeland hope for the day when another company makes JCL RS-1s. Some freeloaders wave to friends. If you look closely, you will see some free loaders hitching a ride in theFlorida East Coast car.There is one rider visible from this side, two visible from the other side.Underneath the tree there are a few more homeless people. I would like to find a Pee Wee Herman type figure to placewith the homeless folks to duplicate a movie scene from Pee Wee's Big Adventure . Jimmy cracked corn, and I don't care.Jimmy cracked corn, and I don't care.Jimmy cracked corn, and I don't care.My master's gone away. The Transfer Company delivers its last loads. 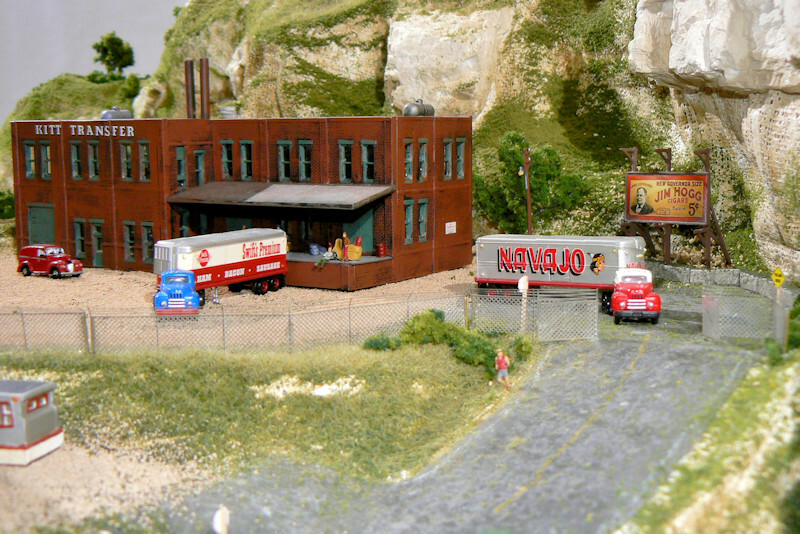 Here's a view of the Kitt Transfer industrial section of town.Nothing says keep out like a chain link fence with barbed wire at the top. (Sorry, I forget the brand at the moment).I epoxied a few brass wire support posts to the fence.Then I drilled a few holes in the scenery base and inserted the supportposts with a drop of glue.The "Jim Hogg" bill board came with the detail package for the ScenicRidge building kit. The Super Chief is in town. 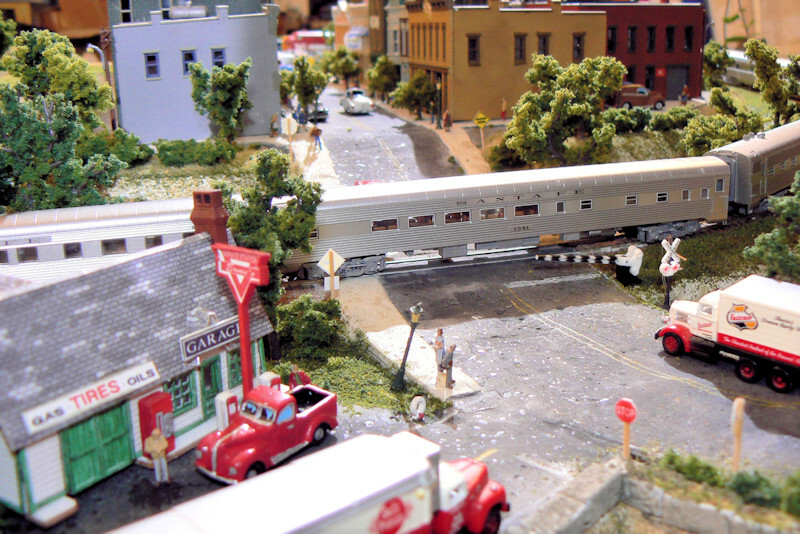 Here the Super Chief passenger train is coming into town.Of course this holds up traffic for a whileand prevents most town folks from getting their Falstaff beer andSwift's Premium sausages. 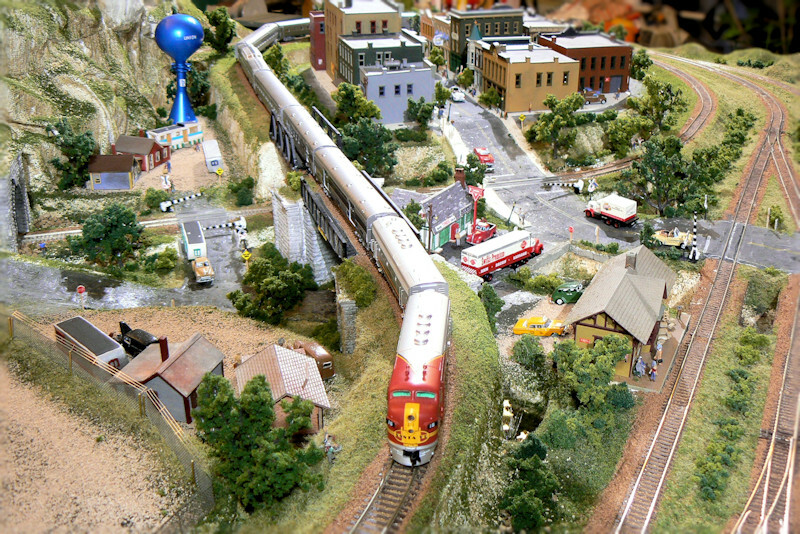 The Super Chief makes a tight bend around town. You can see from this photo that the Super Chief train isbigger than the town itself.The locomotives are Santa Fe F3-A and F3-B units from InterMountain Railway Co.They are set to the same digital command control address, so they reallypull a lot of weight and help motor each other over the rough spots.The passenger cards are the A and B 4 car sets from Kato.From the front of the train are the baggage car, the post office, a 10-6 sleeper,a dome observation car, a diner, two sleepers, and then the tail lounge car.Perhaps one day I will add 4 more cars, but then it will be too big to stowin any of the tunnels. 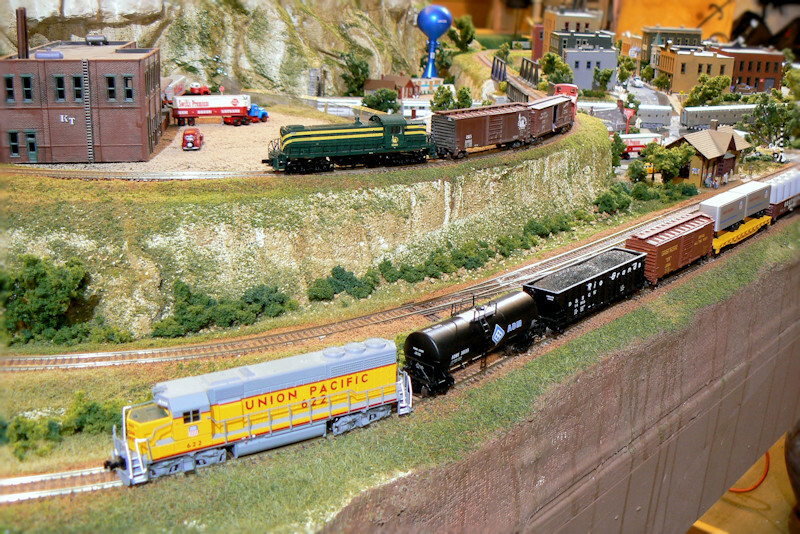 Off the tracks, the Super Chief heads our way. Here is the mammoth Super Chief pulling away from town.It sure is fun to get this one up to speed and whipping around the curves. At this point the layout is completed.I'm sure I spent many hundred hours on the modeling, and manyhundred dollars on the locomotives and the scenery.All along, it has been lots of fun thinking aboutwhat things are needed for this imaginary world: should there be a trailhere, how are people going to drive around, where doesthe water drain, where do people work, are there any poor people in this town?It has been much fun to write about and photograph the layout. 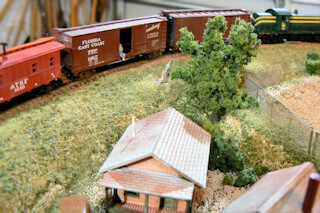 Now I am going to divert most of my hobby time to otherinterests.I don't have any more room in the house or garage, so this will likelybe my last layout for a long while.However, I'm sure I will add a new loco or try to get 10 trains runningat once, so there probably will be a follow-up page some time in the future.Once again I thank you if you have read the articlesor sent an email on the layout or gave suggestions for various pieces. 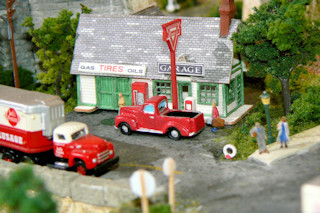 Last modified: Thursday, 09-Jun-2011 13:07:57 MST.